"American Sniper" opens with a moment of intensely rendered drama when Chris Kyle (Bradley Cooper), Navy SEAL extraordinaire, is stricken with an immense heat-of-the-battle decision, to shoot or not to shoot a mother and child potentially on the verge of taking the lives of his comrades-in-fatigues. The film brings us right up to "Yes!" or "No!" and then......flashes back to the beginning of his story. This is a traditional thriller device and one that seems tailor-made to trigger a tidy all-American action-adventure. After all, the real-life Chris Kyle, as the ads ceaselessly bill, was the most lethal sniper in United States military history, one with 160 confirmed kills that directly correlated to an $80,000 bounty put on his head by Iraqi enemies. He was nicknamed "The Legend" on account of his exploits. Yet just as that nickname is employed onscreen not as mere militaristic braggadocio but as a skewering of mythologizing in the midst of events still taking place, the opening sequence plays as a purposeful feint toward a traditional thriller before opting for something more illuminatingly introspective. Clint Eastwood directed the film and while there are several notable battle sequences set in Iraq, these are never the film's strict focus. He, in tandem with writer James Dean Hall (adapting from Kyle's book of the same name), transform "American Sniper" into a patient character study, one that traverses almost nauseatingly familiar ground while nonetheless enlightening specifically because of its resistance to elucidating the war-going experience. The 84 year old auteur's preferred leisurely un-auteurist sorta style allows the theoretically rote introductory moments of Kyle's boyhood with a father demanding ferocious obedience giving way to a pre-military existence as a rodeo rider, a "cowboy" as if he were a latter day John Wayne Green Beret, to effectively encompass a structured life giving way to one of aimlessness. It is not until he heeds Uncle Sam's request in the wake of the twin bombing of African US embassies in 1998 (a sly dig at the reactionary mentality) that his life gains genuine traction, both within the naval ranks and on the homefront, where he eventually marries Taya (Sienna Miller). Their meet cute at a bar is a fairly moldy concept, yet still rings true in how the actress believably communicates in but a few moments her search for something tangible in a wandering life. Kyle recognizes and embraces it. And then 9/11 happens and he goes to war. 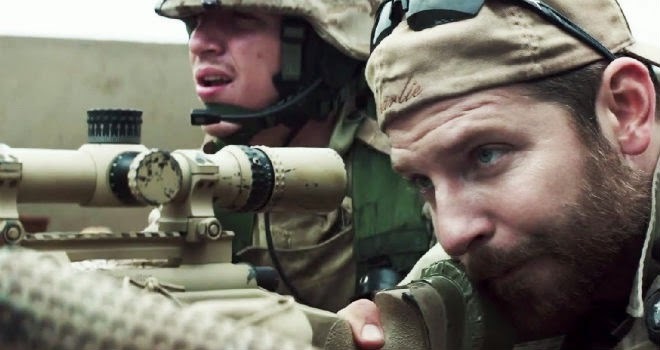 "American Sniper" deftly portrays how the military both builds Kyle up in the very real brotherhood he forms and tears him down in the psychological toils of war. It does not, however, resort to blatant speechifying to make these points, simply letting events accumulate until he is internally hurtling out of control. Nor does it seek to openly politicize. The only examination of the Iraq war from a national perspective is a palpably naive one wherein Kyle wants to serve and protect America because it's America and America is The Greatest Country In The World. Slowly, quietly, that viewpoint is stripped away, and, perhaps without him making the conscious realization, he finds himself accepting extended duty to protect and avenge the friends he has made more than to defend the honor of his country. 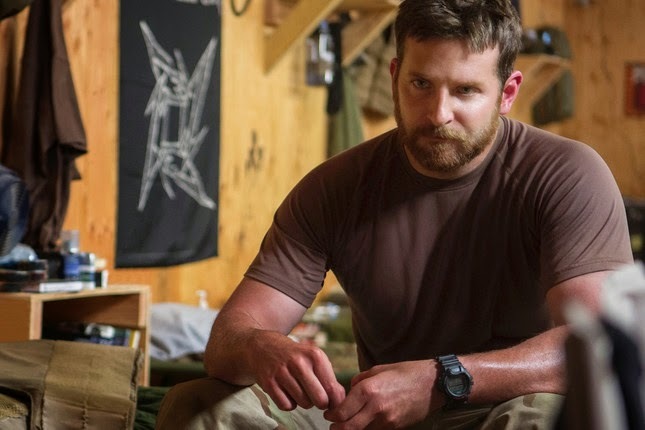 "They won't understand that it's about the men next to you, and that's it," as Eric Bana said in the exemplary "Black Hawk Down", though, to its immense credit, "American Sniper" doesn't even need to say it. “Tell me why you do it. I want to understand.” This is what Taya demands of Chris in a late sequence because she wants to know why he keeps sending himself off to harm’s way in spite of his family, and why he is so shut off and closed down from the world around him. And despite her putting the question to him so pointedly, he doesn’t give an answer. Not because he doesn’t have an answer, necessarily, but because he can’t articulate it. What can you possibly say to get someone who hasn’t lived through it to understand it? And this marks "American Sniper" as an outlier. It's not quite a recruiting film but it’s also not quite anti-war. It says everything by saying nothing. War movies, often rendered by those who have never been to war, so often seek to denounce it or exalt it or explain it. Eastwood has no intention of doing any of these things. Cooper is a revelation in the lead role. Under the shepherding of David O. Russell he tapped into a distinct and marvelously entertaining manic energy for back-to-back powerhouse turns in "Silver Linings Playbook" and "American Hustle." Here, however, he takes that manic energy and purposely represses it so that by the end he is practically bubbling over with a mental strain that he cannot (not will not - cannot) define. In one harrowing scene he has arrived home from war only to avoid his family and take up residence at a barstool. Taya calls him. He admits where he is. She expresses distress. Why wouldn't he just come home. "I guess," he replies, "I just needed a minute." And in that single line reading and in that single bit of actorly affectation, Cooper conveys the toll a serious military life takes. Though we empathize with it, we can't understand it. "What is it about?" I sense people craving to ask in the wake of this film. That's just the thing - we'll never really know what it's about. Aww, great review, Nick. I wish more people shared your opinion in that Eastwood wasn't trying to make a political statement about war in American Sniper. Cooper truly is a revelation, and that scene you mentioned is so gripping. For that scene alone, I'd be happy if he won the Oscar for Best Actor.